You can use the following custom features when creating reports in InfoAssist. Rank. Inserts a ranking column for By and Measure fields in a report. For more information, see How to Rank Fields in a Report. Limit. Limits the number of unique variables in a column. For more information, see How to Limit the Values of a Column in a Report. Page Breaks. Starts a new page in the output when the primary sort field changes. For more information, see How to Add Page and Line Breaks to a Report. Line Breaks. Inserts a line in the report output when the primary sort field changes. For more information, see How to Add Page and Line Breaks to a Report. Subtotal. Inserts subtotals in the output for all numeric fields when the primary sort field changes. For more information, see How to Add Subtotals to a Report. Column Totals. Inserts a grand total row at the bottom of the report to sum numeric data in each column. For more information, see How to Add Column Totals to a Report. Row Totals. Inserts a grand total column to the right side of the report to sum numeric data in each row. For more information, see How to Add Row Totals to a Report. Sub Header. Adds a subheading just below the column titles in the report output when the primary sort field changes. For more information, see How to Add Subheadings and Subfootings to a Report. Sub Footer. Adds a subfooting at the end of the data on each page of the report output when the primary sort field changes. For more information, see How to Add Subheadings and Subfootings to a Report. Pop-up Titles. Adds pop-up titles to report output when the mouse pointer hovers over a column title. For more information, see How to Add Pop-Up Titles to a Report. Data Bars. Adds data visualization bars to numeric data. For more information, see How to Add Data Visualization Bars to a Report. Aggregation. Displays numeric measure data using aggregation options other than the default of Sum. For more information, see How to Display Numeric Measure Data Using Aggregation Options in a Report. Repeat Sort Values. Displays all repeated sort values instead of blanks after the first instance of a new sort value appears in the report. The default behavior is to display blanks after the first instance of a new sort value. For more information, see How to Display Repeated Sort Values in a Report. Recompute. Recalculates the result of a Compute command. Recompute is similar to Subtotal in that it recalculates only at the specified sort break. For more information, see How to Recalculate the Result of a Compute Command. You can add rank columns to the By and Measure fields in a report by clicking the Rank button. You access the Rank button, on the Field tab, in the Sort group. Adding a rank column to a By field inserts a rank column immediately to the left of the field. Adding a rank column to a Measure field creates a copy of the column as a By field and adds a rank column to the left of the new By field. Note: The rank option can also be accessed by right-clicking a By or Measure field and accessing the Rank option through the right-click menu. With a report open, in the Query Design pane, select a By or a Measure field. In the Sort group, click Rank. A rank column appears, as shown in the following image. The only formatting that can be applied is Traffic Light Conditions. You cannot insert breaks or a filter on the RANK column. No column can be moved in between the rank column and the column it is ranking. You can limit the number of unique values that appear in a column through the Limit menu. First you must select a column, then the Limit menu becomes available on the Field tab, in the Sort group. Note: You can also access the Limit option by right-clicking a column, pointing to Sort, and then selecting Limit. With a report open, in the Query Design pane, select a By or Measure field. In the Sort group, enter a value in the Limit field, or select a value from the list. The number of unique values that appear in the column is now limited to value that you set. You can add page breaks and line breaks to report output for the primary sort field. With a report open, in the Query Design pane, select a By (sort) field. From the Break group, click Page Break or Line Break. From the Break group, click Subtotal. If you select Page Break, a new page is created every time the value of the primary sort field changes. Each page includes a new set of column titles, as shown in the following image. If you select Line Break, a new divider line is inserted in the report output every time the value of the primary sort field changes, as shown in the following image. Clicking Subtotal turns Subtotal on for all fields as a RECOMPUTE and inserts a line of descriptive text (*Subtotal FIELD Value). Clicking the down arrow launches a menu of options. From this menu, you can choose between Simple and Recomputed. Selecting More Options opens a dialog box from which you can choose which fields to subtotal, as well as what type of aggregation to do for those fields. You can also change the Subtotal text. Clicking Column Totals adds a grand total row at the bottom of the report that sums numeric data in each column, as shown in the following image. Clicking the down arrow launches a menu of options. From this menu, you can choose between Simple and Recomputed. Selecting More Options opens a dialog box from which you can choose which fields to total, as well as what type of aggregation to do for those fields. You can also change the Current Total text. On the Home tab, in the Report group, click Row Totals. Clicking Row Totals adds a grand TOTAL column to the right side of the report that sums numeric data in each row, as shown in the following image. You can add subheadings and subfootings to report output for the sort field. From the Break group, click Sub Header or Sub Footer. The Sub Header & Sub Footer dialog box opens. In the Sub Header & Sub Footer dialog box, type and style the text, and click OK.
Subheadings appear just below the column titles in the report output every time the value of the primary sort field changes. Subfootings appear at the end of the data on each page of the report output every time the value of the primary sort field changes. The following image shows how subheadings and subfootings appear in the report output. On the Format tab, in the Features group, click Title Popup. Clicking Title Popup displays a pop-up title when the mouse pointer hovers over any column title in the report, as shown in the following image. You can add data visualization bars to the report output for a selected numeric data source field. 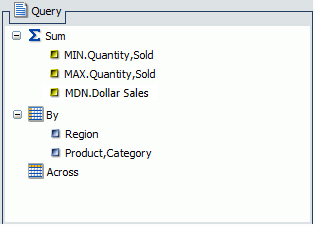 With a report open, in the Query Design pane, select the numeric data source field. In the Display group, click Data Bars. A data visualization column appears to the right of the selected numeric data source field to display values in each row. The column uses horizontal bars that extend from left to right and vary in length, depending on the corresponding data values. The following image is an example of report output with data visualization bars. You can display numeric measure data using a variety of aggregation type values other than the default of Sum. With a report open, in the Query Design pane, select the numeric measure field. From the Display group, click Aggregation. If you change the Measure field container from Sum to Print, Count, or List, it overrides all assigned aggregation type values. The following image is an example of the MIN (minimum), MAX (maximum), and MDN (Median) aggregation prefix operators added to measure fields in the Query Design pane. The following image is an example of report output produced by assigning the Minimum and Maximum aggregation options to measure fields in a report. You can use the Within functionality to apply specific aggregation tasks at different report levels. On the Field tab, in the Display group, click Within, as shown in the following image. Note: Depending on how your data is set up, you can apply the Within phrase on a By or Across field. Optionally, you can access the Within functionality from the right-click menus on the column level, as shown in the following image. You can also access these menus when you right-click on an operator (for example, SUM) in the Query pane. On the Within menu, click the down arrow to select the Within phrase for the By or Across field, as shown in the following image. Select a By or Across field from the list of available fields. Run the report to view output. Run this procedure when the output format, Excel, for example, does not sort properly. On the Format tab, in the Features group, click Repeat Sort Value. When you click Repeat Sort Value, all repeated sort values appear in the report output. This option overrides the default behavior, which displays blanks after the first instance of each new sort value that appears in the report. The first image shows a report before Repeat Sort Value is applied. The second image shows the same report with Repeat Sort Value applied. For more information on the compute command, see Calculation Group. Ribbon: On the Field tab, in the Break group, open the Subtotal menu. On the menu, click Recomputed. Right-Click Menu: Right-click a sort field, point to Break, then Subtotal, and then click Recomputed. Note: Recompute is not available for Across fields.